After not barbecuing very much so far this year, we seem to have gone a long way to rectifying things this weekend. The first weekend that arrives after a holiday is always a busy one and we didn’t have much time to think about what we were going to eat, steak on the barbecue takes very little effort and always provides good results so that’s we decided on for this evening. We had some gardening to do this afternoon and a healthy prune of our herb bushes was much needed. It provided us with a bumper crop of herby green stuff which we put to good use when cooking our dinner. Some of the herbs went on to the fire to sizzle and flavour the steak as it cooked and the rest went into the blender with some oil, lemon juice and seasoning to make a tasty dressing for the cooked meat. I sliced my steak up, spread some of the herby sauce on to a wrap and then loaded it up with steak and lettuce. A little salad and some more dressing on the side and we had ourselves a quick and very tasty dinner. 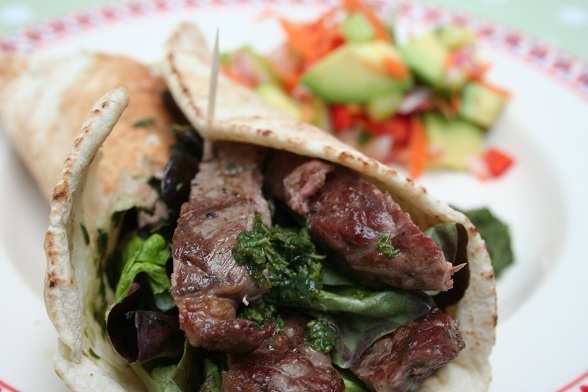 Subscribe to comments with RSS	or TrackBack to 'Barbecued Steak Wraps'. That picture is too much K & S – TOO MUCH! Making me dribble. It’s not pretty. Me dribbling that is, not the steak – the steak is very pretty indeed. .-= Helen´s last blog ..Sardines with gremolata- summer grilling =-. I’m hungry just from looking and reading.